August 28, 2018 By Tiffany 3 Comments By clicking on our links, we might make a SMALL commission - Thanks for the support! See our full DISCLOSURE here. I worry about my kids getting enough fiber, protein and veggies into their diets. I started making smoothies for my self years ago, and my kids were mildly interested as long as it was sweet. But as I have gotten older, and they have gotten older, I care much less whether they need it to be sweet or not, as much as they need to be getting the nutrients they need. Every morning for the past 5 months or so I make a LARGE pitcher of protein smoothie. It is different every day and they are required to have a glass. It only took about 3 days to have them asking when I was making “green drink” each morning!! They love it!!! My bigger kids are even making them for themselves during the day and after school as a snack. The fresh and frozen fruit make them naturally sweet enough that it really tastes like a treat. I do add powdered stevia on occasion if there are a lot of veggies and it gets a little bitter. The great thing is that you really don’t need recipes, and you can add in just about ANYTHING you have on hand. If my bananas are getting too brown and the kids wont eat them, I take the peel off and toss them into the freezer for smoothies. Also, you can really PACK the spinach into the blender. I do about 3 BIG handfuls, it will all blend down! Really push it in there and when you add liquid it will all blend down, then you can add more ingredients if you want. My kids REALLY like the “green drink” smoothies, their favorite is spinach, pineapple, and vanilla protein powder, ice and milk. 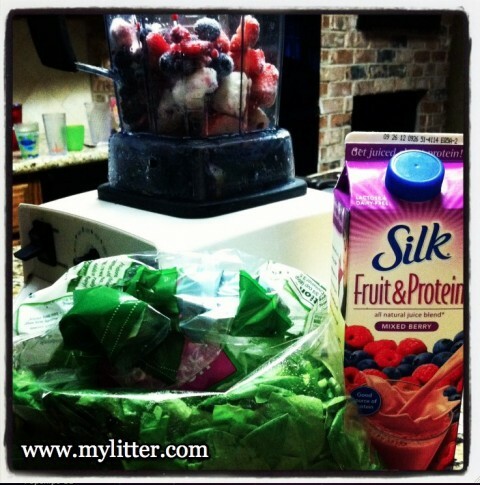 It is fun to experiment with different ingredients, protein powders, fruit, and veggies to make different combinations. It can get expensive though and so shop around. I always look for protein powder on clearance and order most of mine online. We have been replacing smoothies with cereal and milk and so I am saving on cereal (although I don’t sound much on cereal anyway!). I buy most everything online at Amazon and Vitacost. Vitacost was giving out a free $10 to spend and I got hooked. PB2 Peanut Butter – Over 90% of the fat is removed from the peanut! You can get regular or chocolate flavor. 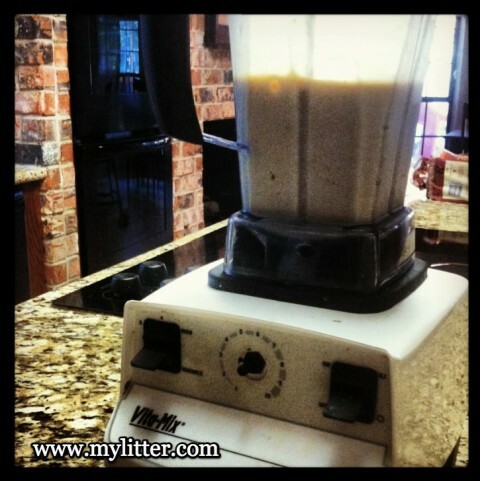 Vita Mix Blender – This is my blender, I have had it for 10 years. I JUST replaced the pitcher last month for the first time and have used it about 20 days a month for 10 years. Thats about 2500 smoothies! They are pricy but worth it. Had I bought the smoothies I made in the past 10 years, I would have spent about $15,000. Crazy huh?! NuNaturals Stevia – This form is perfect for sprinkling on cereal, yogurt as well as mixing in beverages. Give it a shot, smoothies are awesome and a great way to get some good stuff into your kids!! Tiffany, those look yummy! Almost identical to the ones I make. The kids love them! Never thought about adding liquid vitamins. That’s a great idea! I’ve been following Green Smoothie Girl for a while now. She is amazing! We drink spinach packed smoothies everyday. Great way to get the kids to eat raw greens. 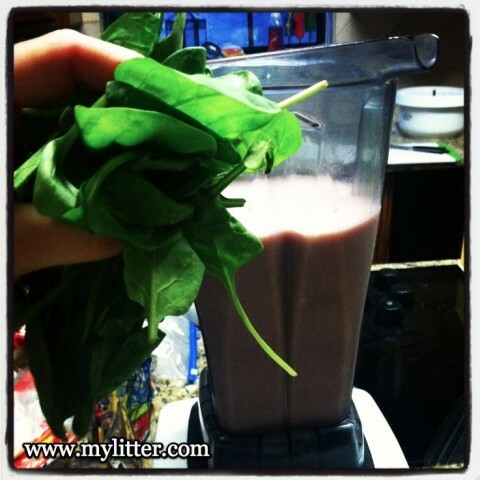 Can you freeze raw spinach (to keep it from going bad) and use it in a smoothie too? Or would that mess up the consistency?